Our school community is centered on our commitment to follow Christ and strives to be welcoming and inclusive to all. This is a first principle in our curriculum, practices and policies. This is evidenced in our written guidelines for behavior and lived out in our practices. We are committed to a school-wide environment conducive to learning. Our school’s philosophy calls us “to discern and maximize the gifts and needs of each student.” In doing so, our teachers are receptive to implementing best practice innovations. Through periodic assessments, we track our progress in supporting all students’ growth. Our school community values excellence; OLG continues to exceed those expectations, setting the bar ever higher. Twice, we have been awarded a National Blue Ribbon from the U.S. Department of Education. Each year, our students demonstrate exemplary performance on state achievement tests. A key resource for our success has been OLG’s award-winning technology program. Our teachers effectively integrate the use of technology within the curriculum. K-5 students enjoy access to iPads, mobile labs and a computer lab. SMART Boards™ in every K-8th grade classroom further integrate teaching, technology and curriculum. Each Middle School student has a dedicated Apple MacBook for use at home and school. Through the lens of Christian values, we work with parents to guide students’ use of technology and all it can offer to stimulate more effective learning and skill development. On Thursday, February 2 2017, Archbishop Hebda came to celebrate the Feast of the Presentation of Our Lord with the School Children. 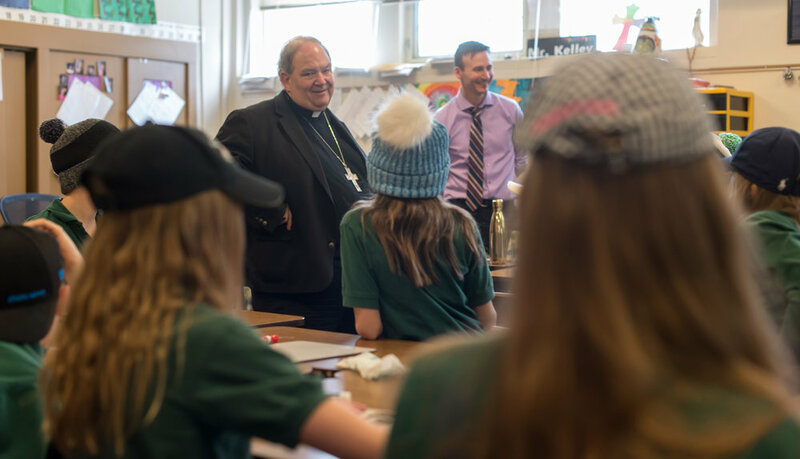 After, he took questions with our 8th Grade students, and then visited classrooms at Our Lady of Grace Catholic School! Men's Club Winter Gala Auction - BID ONLINE!